Flower power helps beat the vandals in Denbigh | News by Wales Express News, People Before Profit! Flower power is uniting the community and beating the vandals in a Denbighshire town – with the help of cash seized from criminals. From three-year-olds at a day nursery to 93-year-olds at a care home, the Denbigh in Bloom campaign has involved all ages and sections of society, according to organisers. 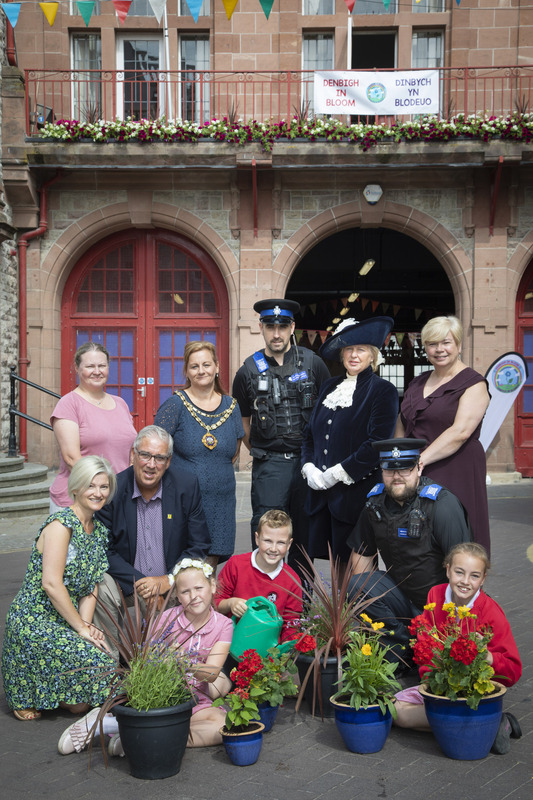 They welcomed the North Wales Police and Crime Commissioner, Arfon Jones, and the High Sheriff of Clwyd, Lady Charlotte Hanmer, to inspect a spectacular show of flowers in the town’s High Street and both were suitably impressed. Earlier this year the dedicated band of volunteers that is Denbigh in Bloom received a £2,000 cash windfall from the Commissioner’s Your Community Your Choice awards which paid for new planters for the town centre. These have been filled with flowers by a small army of green-fingered helpers, including children from local primary schools, tots from a day nursery and residents at a care home. The money also helped pay for propagators, tools, compost and pots to nurture the seedlings and even the current heatwave and drought hasn’t stopped the people of Denbigh who have been out watering the blooms. The initiative is aimed at organisations who pledge to run projects to tackle anti-social behaviour and combat crime and disorder in line with the priorities in Commissioner’s Police and Crime Plan. Denbigh in Bloom Chair Lindsey Tasker said: “It has been a brilliant effort and involved all sections of the community and Graham Pickles from the Greenfingers Garden Centre has even been out with a water bowser to make sure the plants survive the hot spell. “It has been challenging because of the lack of rain but so many people have been involved from little tots from Snuggles Day Nursery to older people with dementia from the Plas Eleri care home on Rhyl Road. Arfon Jones said: “The work done by the volunteers in Denbigh is so important because if you allow an area to go downhill then crime and vandalism increase but if you make it something that is attractive then people take pride in it. “I’m delighted that the children have been involved because it is so important that they are proud of their town and looking at what they have done it is clear that this was money well spent. Lyndsey Tasker said: “We started in the summer of 2016 with just a couple of people who wanted to make the town look a bit brighter. 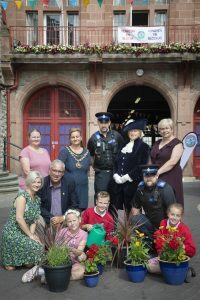 Twice a year Denbigh in Bloom hosts popular Town Plant up Days in the Town Hall and Lyndsey says the funding will enable the group to purchase additional planters for the events this year.